This dictionary, recently published on Oxford Reference, features authoritative and detailed entries that clearly define and describe essential terms relating to hearing, balance, and related disorders. There is little agreement on when the particular branch of science known as ‘audiology’ really begins. Much depends upon one’s view of what constitutes audiology. Definitions vary slightly but basically all agree that audiology is the science, study, measurement, or treatment of hearing, hearing loss, and associated disorders. Although the word ‘audiology’ itself seems not to have come into use until after World War II, the study of hearing and hearing defects began many centuries before. The earliest written sources of information that we have, concerning diseases of the ear, come from ancient Egypt and they describe symptoms of deafness, ear discharge, tinnitus, and earache, i.e. the same problems as we have today. The Ebers papyrus (1550 BC) is the most interesting with regards to ear disorders and contains ‘cures’ for various symptoms. Some of the cures from this early papyrus seem rather odd to us, for example using head of shrewmouse, stomach of goat, and shell of tortoise (presumably ground) dusted into the ear canal. Others are easier to understand, such as the use of willow for pain (willow contains salicylic acid, still used as the basis for aspirin), and honey, which is antibacterial. Other ideas described in this papyrus also seem far-fetched, such as that the breath of life enters the right ear and the breath of death enters the left! Greek medicine played a major part in the development of hearing science. Hippocrates (460–375 BC), the famous doctor and philosopher, attempted to account for the causes of disease and, although he believed deafness was mainly related to the prevailing winds and weather, he also reported deafness due to head trauma. Around 500 years later, Aulus Cornelius Celsus (25–50 AD) made use of a wide range of earlier Greek medical texts to write about various ear cures (amongst much wider writings). He tended to avoid the more outlandish folk remedies recommended by his contemporaries (for example veal suet with wild cumin to cure tinnitus, as suggested by Pliny the Elder) and some of Celsus’ ideas are not so far from our own, although not all of his cures would go down well today. His suggested cures for tinnitus, for example, included inserting castoreum mixed with iris oil or laurel oil into the ear. We might not wish to try this as it must have smelled terrible (castoreum is the strongly smelling oily yellow secretion that the beaver uses to mark its territory). Yet his suggestions are quite sensible as the contents of castoreum varies according to the animals’ diet but includes salicylic acid from eating willow twigs, and the oils he suggests for mixing with castoreum all have anti-microbial or anti-inflammatory properties. ‘Vintage Eckstein Bros., Inc. Screening Audiometer, Tetra-Tone Model EB-46, Circa 1975’ by Joe Haupt. CC BY-SA 2.0 via Wikimedia Commons. However, let’s move on to more modern times where testing and measuring hearing started to develop. In 1834 Weber described a tuning fork test still used today, in conjunction with the Rinne test (1855), to differentiate conductive hearing loss from sensorineural loss. 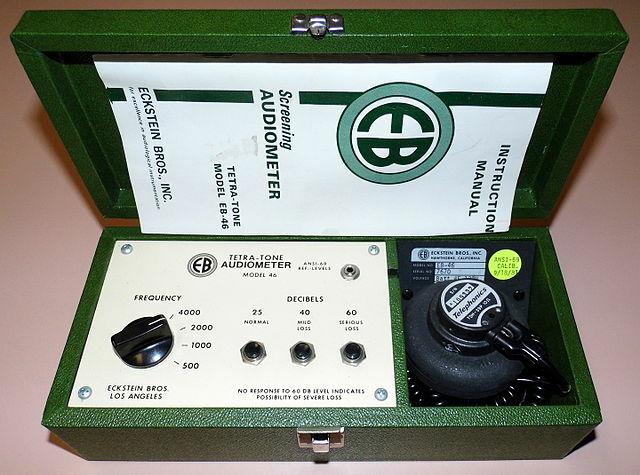 The first commercially available audiometer to measure hearing appeared in 1922 – the Fowler & Wegel Western Electric 1A – which measured across 20 octaves from 32Hz to 16384Hz. The next version, 2A, included bone conduction testing and was calibrated to the range 64 to 8192Hz, which is nearer to the range most commonly used today. 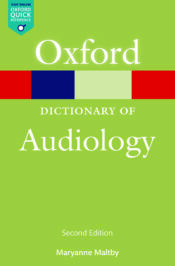 The original creator of the term ‘audiology’ is uncertain although it has been suggested (Newby, 1958) that it was first used as early as 1939. In any case the term was certainly not widely used before it was popularized by Raymond Carhart (1912–1975), an army speech pathologist, and Norton Canfield, an army otologist, when thousands of servicemen returned from WWII with noise-induced hearing loss due to the explosions and machinery of war. The earliest use of the term reported in the Oxford English Dictionary is 1946, when it was announced that a ‘specialist in the care of the deaf’ was ‘appointed senior consultant in audiology’ in the Ada (Oklahoma) Evening News. The profession continues to emerge and develop. Developments such as the immittance bridge by Otto Metz in 1946 (leading to the practice of tympanometry), and of masking to provide a recognized way of obtaining accurate audiometric results (Hood 1960), and discoveries such as otoacoustic emissions by David Kemp in 1977 (now used in universal neonatal screening) are some of the many great scientific and clinical advances that have led to changes in the discipline and a broadening of scope of practice. Featured image credit: ‘Traditional hearing aids’ by Ike Valdez. CC BY-SA 2.0 via Flickr. Maryanne Maltby, lecturer and examiner in Audiology, has written several books on Audiology for students and professionals, culminating most recently in the Oxford Dictionary of Audiology, available online through Oxford Reference. Her career path has included working as a teacher of the deaf, an audiologist and a lecturer at Oxford Brookes University, the University of Manchester, and Anglia Ruskin University, Cambridge.